Today, the CMS announced that it added another 89 ACOs to the Medicare Shared Savings Program (MSSP). Including the original 6 Physician Group Practice Transition Demonstration participants, the 32 Pioneer ACO, and the 27 MSSP participants announced in April, that brings the total number to 154, serving more than 2.4 million Medicare beneficiaries. Beginning this year, new applicants will be accepted only annually. The full list of new ACOs is available here. Is there a complete list of the 154 ACOs anywhere? 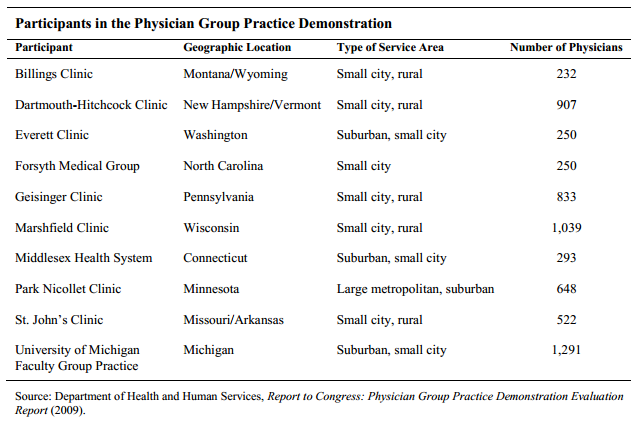 The list of 6 original Physician Group Practice Demo sites is available at http://rewardhealth.com/wordpress/wp-content/uploads/2012/07/List-of-PGP-Demo-Participants.png (which is from Table 2 of Nelson’s paper at http://www.cbo.gov/sites/default/files/cbofiles/attachments/WP2012-02_Nelson_Medicare_VBP_Demonstrations.pdf). The list of 89 new MSSP participants announced in July is available here. Thanks for getting back to me. I’d been able to find these lists previously but what confuses me is which are the 6 of the 10 original Physician Group Practice Demonstrations are considered in the 154 count. I haven’t seen anywhere which 6 are included and which 4 are not. Do you know? Thanks so much for all of your help! Emilie T, I think the difference is due to the fact that some of the original 10 PGP Demo project participants are also participating as Pioneer or MSSP ACOs. For example, University of Michigan was in PGP Demo and also has joined with IHA in Ann Arbor to participate as a Pioneer ACO. I suspect there are three other such examples.